If there's one thing I learned from upgrading several family members' Android devices over the past week, it's that people are really attached to their WhatsApp history. While my smartphone days kicked off in 2007 with switching to a new review unit every couple of weeks (followed by flashing a new ROM at least once a week in 2011-2012) and learning to let go of everything I couldn't bother to move around, most users aren't accustomed to losing their data. They want their new device to have exactly what their old one had: their contacts, chat history, photos, music, and so on. 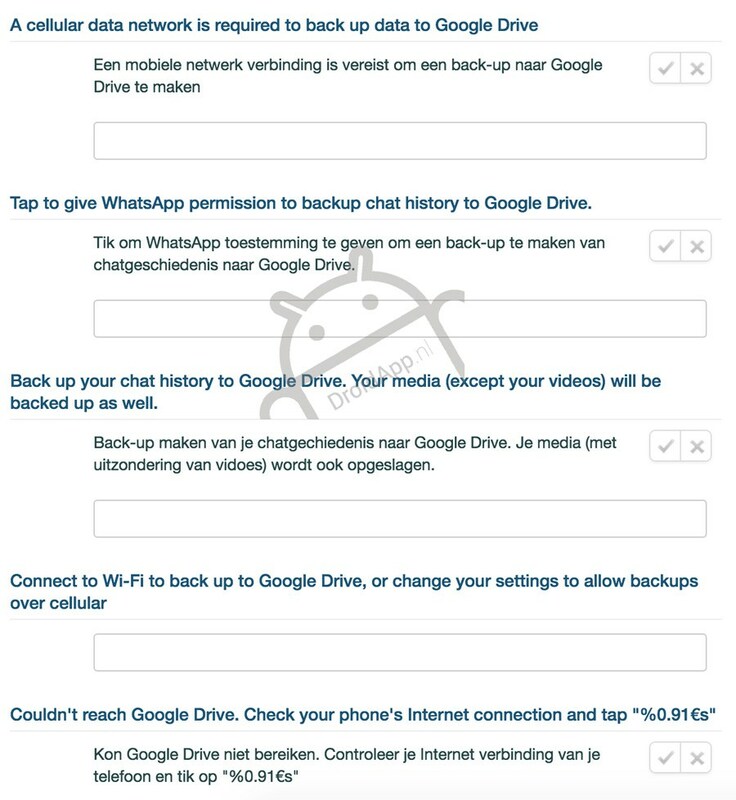 WhatsApp currently offers a backup and restore function but it requires a certain level of geekery to be carried through: you have to look for the backup option, find the folder on your internal memory or SD card, figure a way to move it over to the new phone, then install WhatsApp and hope that you did everything right by the time the app launches so that it recognizes your backup and offers to restore it. It seems though that WhatsApp is gearing up to offer a new and simpler option for backups: Google Drive. 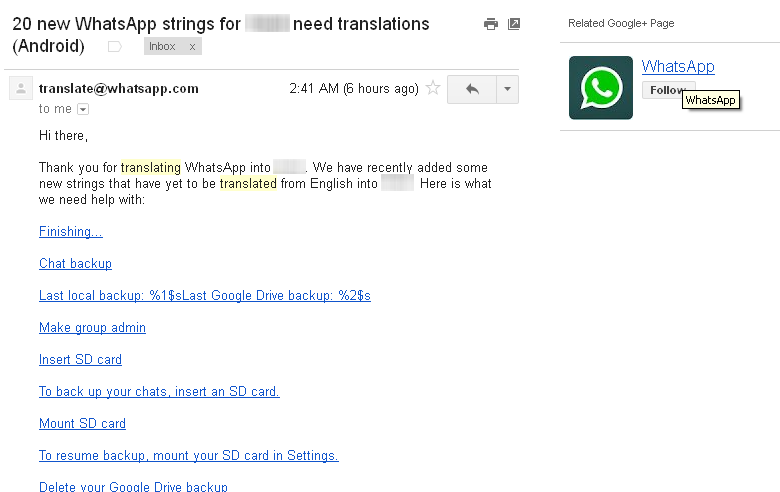 Thanks to K.S., a member of the WhatsApp translation group who tipped us, we know that there are new strings in the app that point toward backing up and restoring from Google Drive. In the screenshot above, you'll see that there's a time stamp for the last Drive backup and an option to delete it. The information is further corroborated by the dutch site DroidApp.nl, who has received the same set of strings to be translated, with a few more to complete the picture. It appears that the function involves backing up chat history as well as media, but not videos, and can be restricted to Wi-Fi only or used over cellular networks too. Restoring seems to be offered once when the app launches on a new device, and if you don't accept, you lose the old backup. This stays firmly in the unconfirmed rumor territory, but the number and detail level of the strings along with the fact that they were spotted in two different localized translation groups are signs that this is likely to be true. The timeline of its release though remains a mystery.